Categories: Compostable bags for kitchen use, Other Products. Choose BioBag in your kitchen. Make separating your food recycling clean and easy. The BioBag MaxAir caddy is a handy little food-waste bin which can sit under the sink or on a kitchen counter. 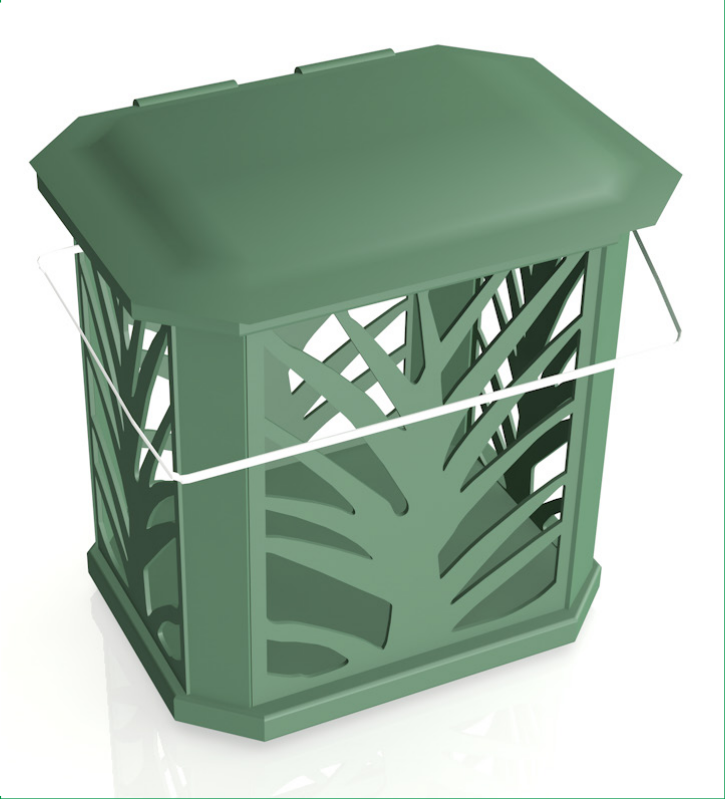 The MaxAir compost caddy is made from recycled plastic and will last for years. It has a hinged lid which makes it easy to scrape plates into. A stainless steel handle makes it easy to carry and move. Line your MaxAir with a BioBag bag and use it to collect food scraps and leftovers, When it’s full, put the bag straight into your Brown/Organic Bin keeping it clean and dry. 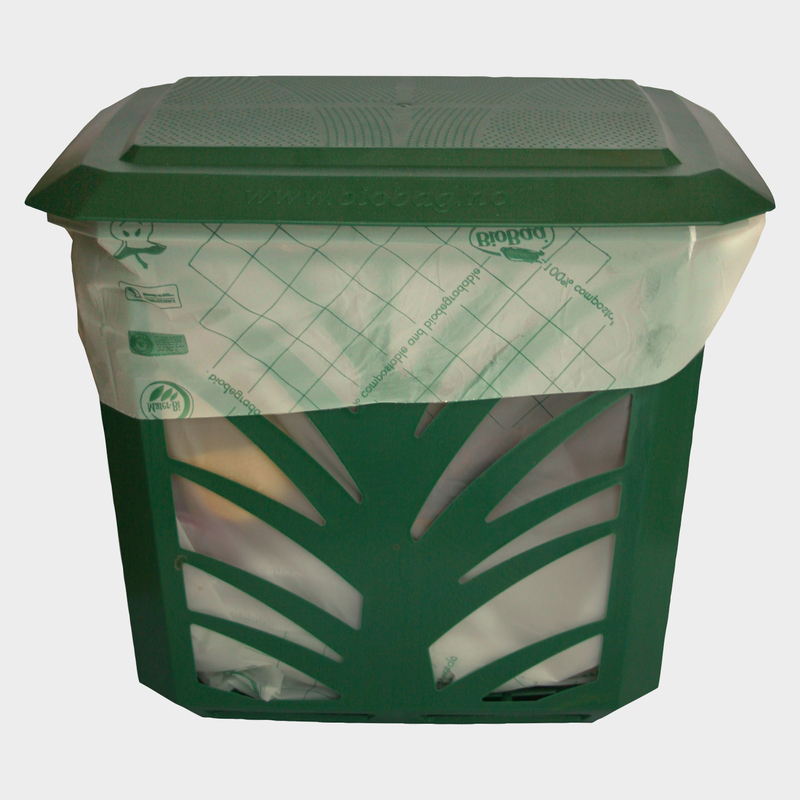 Our BioBag 10 litre compostable bag, with a tie top, is a perfect fit for the MaxAir caddy. A roll of 20 bags should last a family of four for up to 14 weeks. BioBag bags are made from plant starch and are 100% compostable and biodegradable. BioBag bags are certified according to European Standard EN 13432 and US Standard ASTM D6400. Our bags are accepted by all Irish waste collection companies in their organic waste collections. In addition, all BioBag bags are certified for home composting and carry the AIB Vincotte (OK Compost) certification. BioBag bags breakdown to CO2 and water in the formation of compost in both home and industrial settings, leaving no microplastic pollution behind. It takes about 12 to 14 weeks for a BioBag to break down in industrial or home settings. 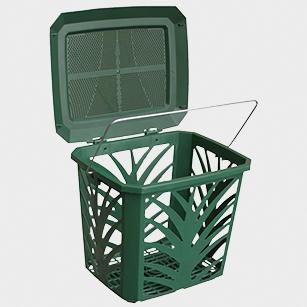 The MaxAir caddy is superior to other compost caddys & paper boxes sold in some stores, as it has ventilation slots on all sides, including the lid. When a breathable BioBag bag is used to line your caddy, moisture from waste food can evaporate. This keeps the contents odour free and eliminates mould and mildew almost completely. As the moisture has evaporated you can reduce the weight of your food waste by up 40%. The BioBag MaxAir caddy can be kept on a countertop or under your sink so it’s easy for you and your family to use.